I spent a wonderful morning with the staff of Washington West Supervisory Union in Central Vermont, including these great teacher-librarian readers who read MARTY MCGUIRE with the Global Read Aloud. It was truly energizing to be around educators so committed to staying true to students and authentic learning in the midst of all of our “educational reform” twists and turns. I do a wide variety of presentations and workshops when I visit schools, but some of my favorites are the writing and revision workshops, where I get to work with smaller groups of excited student writers, and this crew of 7th and 8th grade girls was just amazing. They had such fresh, thoughtful ideas in our “Writing the Future” workshop that I have no doubt I’ll see some of their books on shelves one day. The authors on the bus go scribble, scribble, scribble… This festival was SO much fun. The dozen or so authors invited to sign and speak at Providence’s Lincoln School rode a cute little bus from place to place, which was great because we had so many opportunities to talk and laugh. The festival itself was simply amazing — an incredibly well-organized celebration of books and reading – and it was an absolute joy to be there. 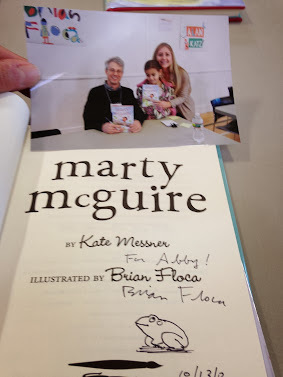 One reader brought me a copy of MARTY MCGUIRE that illustrator Brian Floca signed for her at last year’s festival! 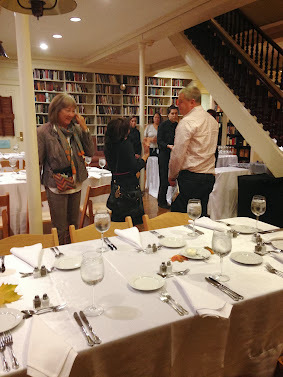 The post-festival dinner for authors and organizers was quite a treat, too. 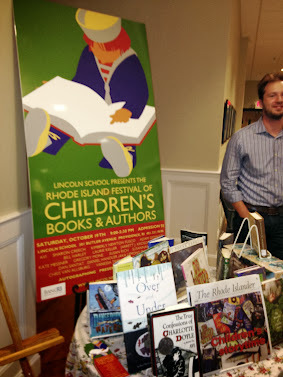 It was held at the Providence Atheneum – book-nerd heaven. I may have been a bit over-enthusiastic about the library setting. At one point, storyteller Bill Harley tactfully brought this to my attention when he said, “I don’t know if you realize this, but you’re kind of petting that card catalog…” Before you judge, you need to understand that it was full of hand-written cards dating back to the 1800s. I couldn’t help myself; I was smitten. 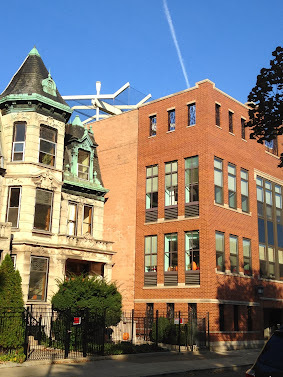 I had a great day at Saint Clement School in Chicago’s Lincoln Park. The second graders welcomed me with a bulletin board full of sea monsters! The kids were absolutely wonderful, and I always love seeing how different schools are from one another. Because Saint Clement is in the middle of the city, space is at a premium, so its playground is on the roof! My second Chicago-area school visit was at the wonderful Whittier School in Downers Grove. We spent an energy-filled day writing together in the gym – everything from Halloween stories to myths! Hope you’ve had a wonderful fall, too!